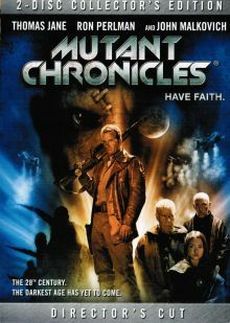 Mutant Chronicles, starring Tom Jane and Ron Perlman, is based on a popular Pen&Paper role playing game. Its movie adaption had been planned for a long time and even was offered to directors such as Stephen Norrington and John Carpenter. However, the rather unknown director Simon Hunter was hired in the end. For a long time, there was not much heard of this movie due to the long post production. Looking at the movie, we can easily guess what took so long: Almost every scene features CGI elements or scenery, the effects are completely in CGI as well. And exactly those effects were the reason for the release of two different versions in Germany. In the US, however, yet another version was released in August 2009, the Director's Cut allegedly favorised by Simon Hunter. In contrast to the usual Director's Cuts, this version is actually shorter than the original one. "Magnolia have been really great in letting me go back to the cut and removing certain sections I did not like. This is a brand new cut NEVER before seen. I think with the huge rush of finishing the picture we needed a few weeks of screening the movie to audiences - there were always things I did not like in the cut but I have now been able to correct this. This cut is really the movie I want people to see - rough, fun, choppy and lots of b movie fun - [...]"
Well, let's say that Hunter exaggerated a bit here... The scenes in the DC are not in a different order and there is no new material, the only difference is that he cut 8 scenes, which slowed the movie down a bit. The movie is getting faster but not necessarily a lot different. It is up to yourself to decided whether these scenes should rather have been left in the movie for a better understanding or not. Comparison between the US Director's Cut by Magnolia Pictures and the uncut R-Rated version taken from the German SPIO/JK DVD by Splendid. 0:02:04: The original version features an overlay stating the year (2707). 0:08:35: The soldiers are putting on their gas masks, one of them vomits. 0:16:41: The whole background of why and how the mutants suddenly attack is missing here. Brother Samuel is looking at his book. Out of the off, he then tells about the fight in the sky and about the "bad star", who lost the fight and fell on the earth. The bad star then created mankind and a machine that stole the souls of the dead and turned them into undead. The old tribes fought against the enemy and buried his machine. But the protective seal that kept the tomb shut was destroyed in the war and the machine was activated again. The mutants fled from their prison and dragged the soldiers' corpses in the hole so the machine could start its work again. The dead and dying mutated and became enemies of man. Even the might of the four world corporations could not stop it. However, it is written that the chosen one will climb down in the pit and will save mankind. Samuel went to the corporations to ask for help. 0:19:29: During the tracking shot into the tower, there is a different score. The theatrical version features a rather orchestral background music, in the DC it is rather gloomy. The dialog afterwards (in which Constantine asks a leader of a different corporation how much time they had) was integrated in the tracking shot, too. Therefore, the DC lacks an insignificant scene of brother Samuel bowing over a table and Constantine getting a pill out of a small box. 0:21:24: Mother and son are fleeing the invaders longer. 0:26:17: Mitch visits Rooker's wife and daughter. After she let him in, she makes him tea and tells him that he had changed a lot. Mitch then has a hard time telling her that Rooker was missing and probably dead. He reads the rather formal text by the government out, to these words we see some scenes of Rooker fighting. His wife cries and desperately says that she could see him in her dreams and that they hurt him but he was not dead. Mitch answers that these thoughts were bad for her and that she should think of her daughter instead. The wife answers bitterly that she would be left to die out there anyways and that she did not know what to tell her daughter. 0:30:49: The original version shows Rooker's wife's intention to kill herself and the child, but just in time the evacuation passes are being delivered so she does not do it. 0:33:59: Von Steiner is sceptical, but the monk answers that the information did not originate from a manual but from ancient tradition. The "bomb" was to be applied in the middle of the machine and the symbols probably were warning signs. 0:34:45: When Jesus asks what would happen if they did not find the key, the monk answers that the mission then would fail and all men, women and children on earth would die. 0:39:05: Brother Samuel is celebrating the last evening mass. He then talks about Severian, the guardian of the chronicles, who was on her way to help mankind, too. 0:46:29: Mitch asks the pilot, where they were. He answers that they soon would arrive in the imperial sector. Mitch then asks him what he would do after he had dropped them off and whether he would fly to another planet afterwards. Whe hears that there was not enough fuel for that, Mitch states that it was a suicide mission for the pilot as well. The pilot then says that man would do everything for a certain reason and that he would be just the same as a mutant if he did not. 0:54:34: The group walks through the city and takes cover when some mutants show up. Jesus makes a joke and wants to take the bomb from von Steiner. When the mutants disappear, they come out again. 0:59:00: A shot of the map is missing. Juba says that the church was not far away in the centre of the old city. 0:59:23: Jesus can be seen spitting out vulgarily. 1:12:40: Valerie asks von Steiner who his tickets were for. After some time he gets them out of his pocket and Valerie apologizes. Afterwards, brother Samuel tells his viewoint again. The humans, created by god, would represent life, whereas the demonic mutants symbolized the lifeless things. Mitch asks him what he should think if he did not believe in god, but Samuel just answers that he would not be there then. 1:39:12: In the DC, the ending credits are shown directly after Mitch was faded out. The original movie features a shot of the stars, we then see the space ship flying and a sign displaying the name of the movie again before the credits start rolling.